NEW ORLEANS – For the first time this season, there is a little consistency. 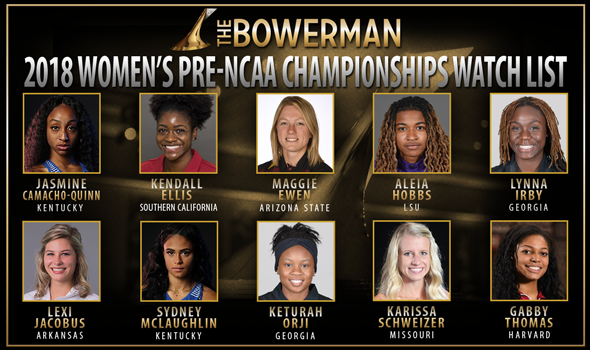 The 2018 Women’s Pre-NCAA Championships Watch List for The Bowerman was announced on TrackTown Live this afternoon, and the list of 10 went unchanged from the last iteration that was announced back on May 16. The 10 women that grace the list will all compete at the NCAA Outdoor Track & Field Championships that begin tomorrow, May 6, in Eugene, Oregon. Kentucky has a pair of women in Jasmine Camacho-Quinn and Sydney McLaughlin that will look to help the Wildcats bring a championship home to Lexington. Camacho-Quinn qualified for four events, while McLaughlin found herself in two. Camacho-Quinn enters the meet as the fourth-seeded 100-meter hurdler, posting a time of 12.90 at the NCAA East Prelims. She’s also the eighth-seeded 200-meter runner after notching a 22.73. She and McLaughlin are a member of Kentucky’s 4×400 relay team that will compete, and Camacho-Quinn is also slated to run in the 4×100, an event in which she helped the Wildcats win a national title a season ago. McLaughlin ran a 55.50 at the NCAA East Prelims, making her the top-seeded 400-meter hurdler at the NCAA Outdoor Track & Field Championships. Like Kentucky, Georgia also has a pair of women featured on the Watch List in Keturah Orji and Lynna Irby. Orji hopes to secure her third-straight outdoor triple jump title, and enters the meet as the top-ranked qualifier after posting a mark of 14.06m (46-1½). The two-time finalist for The Bowerman will also look to win her first outdoor long jump title, an event in which she ranks second amongst qualifiers with a leap of 6.40m (21-0). Irby is looking to make her mark on the sport in her inaugural outdoor championships. The freshman from Indianapolis leads all qualifiers in the 400, having notched a time of 50.44 at the NCAA East Prelims. Irby also sits third in the 200 after running a 22.56. Kendall Ellis of Southern California qualified for the 400 this week, as well as both relay teams for the Women of Troy. The native of Pembroke Pines, Florida, ran the second-fastest 400 time of any qualifier, notching a 51.03. Southern California’s 4×400 relay team, which Ellis anchors, sits third in seeding with a time of 3:30.57. Thrower Maggie Ewen will compete in two events this weekend for Arizona State. She recorded a 19.13m (62-9¼) at the NCAA West Prelims in the shot put, which leads all qualifiers. The product out of St. Francis, Minnesota, also ranked third in the discus amongst qualifiers, hitting a mark of 59.37m (194-9). Ewen will be looking for her first outdoor national titles in both events, but did not qualify in the hammer throw, an event in which she set the collegiate record earlier this season. LSU’s Aleia Hobbs enters the final meet of the collegiate season as the top-seeded 100-meter runner while also serving as the anchor of the top-seeded 4×100 relay team. The product out of New Orleans helped the Tigers run a 42.42 at the NCAA East Prelims in addition to posting a blistering time of 10.90 in the 100. Arkansas’ Lexi Jacobus set an NCAA Outdoor Track & Field Championship meet record in the pole vault when she took home the title in 2016 with a mark of 4.63m (15-2¼). The product from Cabot, Arkansas, will look for her second outdoor pole vault title in three years after clearing 4.18m (13-8½) at the NCAA West Prelims. Missouri’s Karissa Schweizer could become just the sixth woman to win the 5000 and 10,000 races at the same outdoor championships. The Urbandale, Iowa, native won the 5000 a year ago, and is the top-seeded runner in that event (15:19.65), as well as the 10,000 (32:14.36) ahead of this week’s meet. Harvard’s Gabby Thomas is looking to become just the sixth woman from an Ivy League program to win an NCAA Outdoor Track & Field title. The product of Florence, Massachusetts, will have two chances to do so, as she qualified for the 100 and 200. Her mark of 22.42 in the 200 at the East Prelims is the top-seeded time heading into the meet, while her time of 10.99 in the 100 sits second. Also receiving votes was Northern Arizona’s Brooke Andersen, San Diego State’s Ashley Henderson and New Hampshire’s Elinor Purrier. Semifinalists for the The Bowerman will be named on June 13.